When you talk with your neighbours, family members and colleagues, do you hear the same question in their never-ending search for satisfaction? For those of us with a Christian faith, the answer is yes. For while this life can be wonderful, exciting and interesting, we know this isn’t all there is. In fact, it’s this certainty that helps us find joy and purpose in this life, not only in the pleasures and satisfactions, but also in the challenges and sorrows. We want our friends to know this truth too, to understand we are made for more than this life offers: we are made for a relationship with the living God. 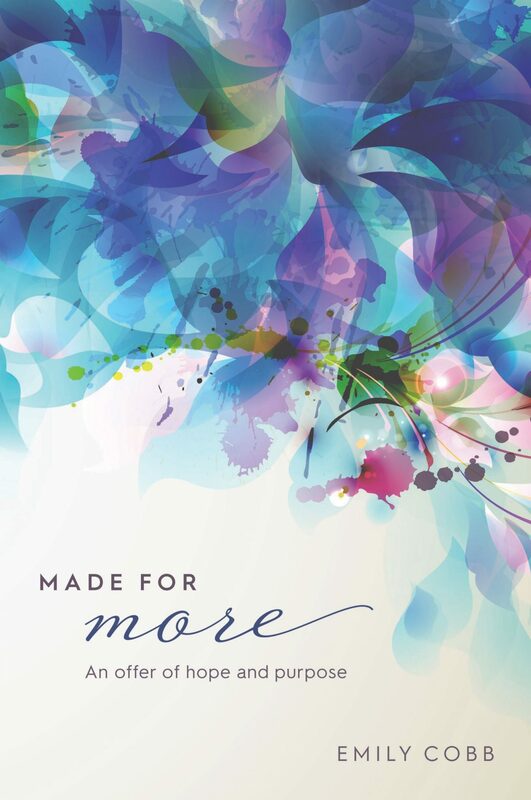 So it’s with great thankfulness that we can welcome Emily Cobb’s book Made for More to the marketplace. Most of the time I don’t notice it—as life has grown busier, responsibilities greater and I’m immersed in so much noise, my longings often get drowned out. Maybe that’s true for you too; the busyness, the chaos and even the delights of life suppress any deep sense of a longing for more. But if we unplug for a moment, and press pause on the busy, what drives who we are? What deep burdens and desires of our heart bubble to the surface? She states her own perspective: that it’s a real relationship with God, who can be known, which gives life meaning, and that is what we are all longing for. we are made for a relationship with the living God. You may feel like a pretty good person, and on the whole I think a lot of people on earth seem like fairly decent people. You may love others, you may care for the sick and downtrodden, you may work hard, you might even take that extra change back to the checkout if they give you too much. So this whole thing of you and me being sinners doesn’t sit well with you. Surely sinners are murderers and people like that, people who do really terrible things—not ordinary people like you and me. From this we move to four different emphases on Jesus: he is the Son, the life giver, the saviour and the King. Scripture is used to explain and expand each of these. Included is how Jesus was obedient even though he was tempted (Matthew 4), and that he gives life—using the example of the bleeding woman (Luke 8:43-48) and the Samaritan woman (John 4:1-42). The account of Mary leads into a clear explanation of Jesus’ death, why it had to happen and what it accomplished. These finish with a discussion of the realities of heaven and hell, under the banner of explaining why Jesus hasn’t returned yet: God is giving more people more time to come to him. Very helpfully, she openly acknowledges that we would prefer not to talk about hell, but we need to face its reality. When they start to wonder, “Is there more to this life?”, you can—with conversation and this book in hand—answer convincingly, “yes”. In the final chapter, the reader is guided through the results of living the life you were made for, including: you are not alone (you have the Spirit), you’re a new person, you’re forgiven, and you no longer need to fear death. Life changes for you as you get to know God more (through the Bible), he hears you (through prayer) and you have a new family (through church). Now you can live your life with purpose. At just on 100 pages this book is an easy read. The chapters are succinct, but without skimping, so that anyone who is searching can find answers to their main questions. It’s aimed at women. The biblical examples often use women, and the formatting and publishing look have a softer feminine feel. So, while the content is entirely suitable for men, and I’m not always convinced about the need to separate readers, this will be a book that women will probably give to other women. I can think of several women in ministry who will use it as a resource. Cobb has a chatty, open writing style and her illustrations will connect with various ages and stages, from teens right through to mature readers. In addition, her stories about herself have an honest humility that resonates. This is a great primer book about the gospel to have on hand to give to your enquiring friends. When they start to wonder, “Is there more to this life?”, you can—with conversation and this book in hand—answer convincingly, “yes”.